The farmers' markets here in Southern California are amazing -- you can find dates, figs, guavas, kumquats, passion fruit, persimmons, and pluots, but rarely do you see humble blueberries. 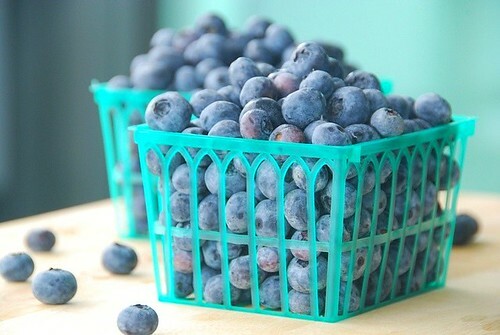 I grew up picking and eating fresh blueberries every summer back in New England. Why, I wondered, are they so hard to find in California? The problem is dirt. Apparently blueberries like to grow in highly acidic soil and Southern California has alkaline soil. This presents a challenge to growing blueberries in Southern California (which explains why most the of the blueberries I buy at the market are from Washington). New England's acidic soil is perfect for blueberry bushes. I don't know what was better, marching along rows of blueberry bushes, basket in hand, with blue lips and fingertips or standing in the kitchen watching my mom use my very own fresh picked berries to make sweet blueberry buns with lemon icing, old-fashioned double crust blueberry pie, or a loaf of hot blueberry-corn bread (that went straight from the oven to my mouth). So when I found these pristine Washington State blueberries, I bought 3 pints. After eating enough berries to make me worried I might overdose, I decided to bake something with the remaining berries. So here is a variation of Mom's old-fashioned corn bread. Infused with tart lemon and savory basil, this moist cornbread makes a lovely addition to a summertime brunch or picnic. After baking an Olive Oil Cake with Rosemary and Lemon last year, I have enjoyed experimenting with various fresh herbs in baked goods. Whereas rosemary's bold flavor remains unaltered by the oven's heat, fresh basil loses much of its intensity. So, here are my recommendations: use an ample amount of fresh basil, such as 1/3-1/2 cup. It won't be overpowering. Or use dried basil which maintains its flavor better. You could use 1-2 tablespoons of dried basil with some fresh basil for a prettier look. Also try serving the bread hot with butter -- you can even make your own basil butter, which has a mild but delicious flavor. Place a rack in center of oven and preheat to 375 degrees F. Butter or coat with cooking spray a a 5 by 9-inch loaf pan and set aside. For the basil butter, stir chopped basil into softened butter and set aside. Remove any blueberries stems. Wash the berries, pat dry, and lightly sprinkle with 1 tablespoon flour to help prevent them from sinking or bleeding color. In a separate bowl, whisk together oil, butter, buttermilk, eggs, lemon extract, and lemon zest. Add to the flour mixture and stir quickly until well combined. Using a rubber spatula, gently fold in the the fresh blueberries and basil. Bake for 35-45 minutes, or until the top is golden and a cake tester inserted into the center of the bread comes out clean. If it needs to bake longer but the top is already golden, then place a a piece of tin foil over the top of the bread to prevent further browning. Transfer the pan to a rack to cool for 5 minutes before removing and placing on a wire rack to cool. Serve hot with basil butter. And check out my Sugar High Friday round-up for more outstanding blueberry desserts including coffee cakes, financiers, muffins, and tarts. I just love the cake like texture of your corn bread, Susan. I don't get the variety of berries here, but I always enjoy your posts and pictures. Wow, the combination of basil, lemon, and blueberries is so intriguing! Since corn is so fresh and readily available right now, do you think I could add some raw kernels in the batter for texture? It looks so good! I'll try it for sure. I wish I would find persimmons here in Seattle.... They are common in Brazil, where I grew up, but can't find them here. 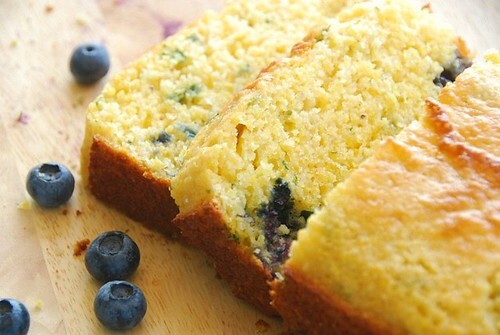 You are so creative - I would never have thought to put blueberries into cornbread, and the addition of basil! You've definitely piqued my interest! Rita--My Whole Foods store here in Pittsburgh always has persimmons during their brief, but glorious season (November-December generally). I figure if my store here has them, your store in Seattle must carry them. Check yours late fall. I've also seen them in my local food co-ops. 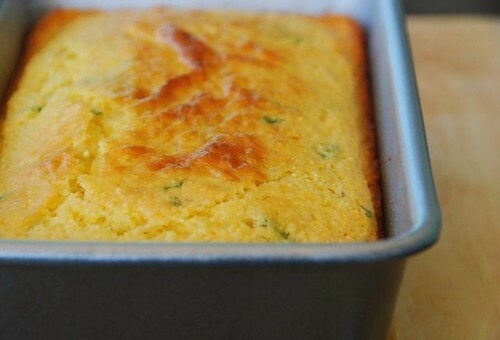 I can only imagine the fragrance that lemon and basil leaves in this corn bread....looks delectable! Please e-mail me...Im' dying to know what type of camera you have. your pics always come out great. I've never had this type of cornbread - but I'm a cornbread aficianado - so i'd try it! wow, now that is intriguing, I'll have to give it a try!! i love your site by the way! I so envy your farmer's markets. And that bread? What an inspired mingling of flavors. As always- your blog is such a visual treat to enjoy! Oh my, this bread just hit all the right spots. Lemon, blueberry, corn, basil? That's 4 for 4! Bookmarking this. Thanks for sharing! 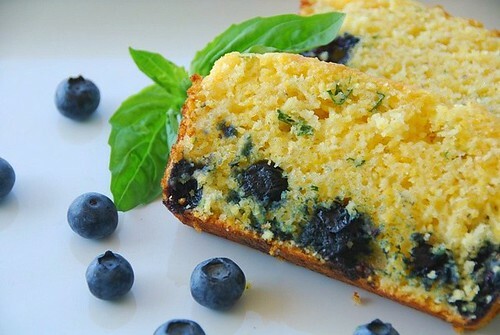 wow, i would never think to put basil...or blueberries...in cornbread! I've got a quart of wild Maine blueberries sitting on my kitchen counter -- a gift from a friend who spent a week in Blue Hill and picked the berries fresh yesterday morning. Had no idea what I would do with them -- but I love the idea of a lemon cake. And basil? Would never have thought of it, but I have lovely basil in the garden. Sounds like a plan! Oh, how awful not to be able to pick blueberries in the summer. They grow wild in the fields and ponds around me in northern Mass. Sure, we live off potatoes and beets, and our soil makes my weak roses hate me, but the blueberries thrive. Ask my horse, and she'll tell you the best times we have are walking through fields with a long leadrope, she eating grass and me picking berries, eating any chance strawberries instantly! What a nice combination of flavors. Would never think of adding basil there. Thanks for this recipe! Yum! This looks delicious. The basil is so intriguing! I'll definitely have to try this one out. Oh man, you're shipping me off to berry heaven. I'm going to *have* to go berry picking this week so I can try this recipe out. What a gorgeous-looking cornbread! For some reason, I don't think I've ever had a sweet cornbread before (just savory), but I imagine blueberries would be a perfect addition. I'd love to make this! this bake of yours look so simply and yet looks so elegant and delicious . . . . ..
What a lovely combination with the basil! Love the pictures! Yum! My blueberry cravings this season remain unabated. I also have an excess of cornmeal in the house. This is one to try. Susan, I have tried blueberries with lemon and they are a match made in heaven. I'm so intrigued by the basil here - this loaf looks so delicious! Blueberries and lemon are a wonderful classic, but you've got me interested in the addition of basil. And not just because it is growing rampant on my fire escape. I also see your loaf has a case of the sinking blueberries. I imagine the coarser grain of the corn makes it even more difficult to keep those little guys aloft. I've seen a billion home remedies for the sinking blueberry problem (coating in flour the most prominent) but nothing ever seems to work for me. Any tips you've tried? Blueberries & cherries are out of season in NJ now, but I did find some lovely Washington State berries, so I will try this for sure. Unusual combo Susan but, as always, delicious! As a Southerner, I'm very picky about my cornbread. Don't like it sweet because it's supposed to go along with bean soup or a pot of beans, or have savory stuff such as jalapenos, cheddar and bacon in it. So you'll understand my initial hesitance when I saw the post title. For over a month now I have been able to step out my front door, walk a few feet to our blueberry bushes and eat those luscious, nutritious little fruits out of hand. The north coast of California has highly acidic soil and one of it's best kept secrets is that we can and do grow blueberries. Your recipe is inspiring and your photos exquisite. If I could resist immediate gratification and not gobble up my blueberries, I'd be making this recipe! 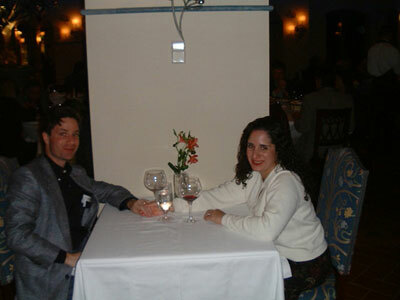 Susan, this is just beautiful food all the way around! You inspire me! Oh, wow. The sweet corn bread is just LOVE. The blueberries are a new touch to me (and basil butter in cornbread, *extremely* new to me), but it sounds like a lovely blend of Italian and American influences. Great stuff! aparna-I'm never the first either, so I know what you mean. Do you get frozen ones? arundathi-You could order cornmeal online. 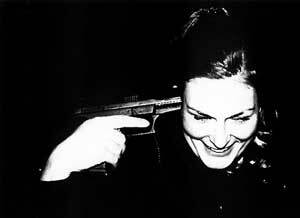 joanna-Sure. In fact, I'll be posting on some corn muffins I made with fresh corn kernels. rita-I never had persimmons until we moved to California, now I can't imagine life without them. So I understand. clumbsycookie-Wow! I'd like to try one of those cookies. darius-A cornbread aficianado, huh? Then I've gotta see some of your recipes! foodlibrarian-You learn so much from FM's, don't you? lydia-Ah, fresh Maine blueberries. I wouldn't have the willpower to bake with them. They'd all end up in my mouth too quickly! anonymous-New England boasts some amazing blueberries indeed. Your walks sound idyllic. val-I love all types of blueberry cakes and muffins. warda-Oh, but I love grape tomatoes too. grace-I know! People have strong opinions about cornbread. erin-I tried the coating in flour and made it twice. One loaf sunk less than the other, but still most sunk. andrea-We New Englanders like a sweet cornbread. A convert, really? Now, I feel great! christine-I wouldn't be able to resist them straight from the bush either! marie-That is so sweet of you to say. 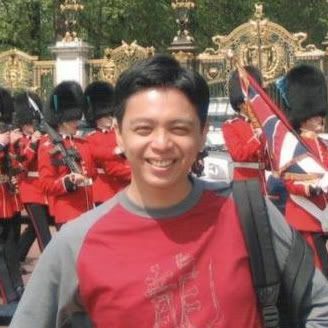 manggy-Wow! Thanks for the kind words. We went blueberry picking on Friday and came home with 13 lbs of super sweet blueberries. I spent all two hours at the farm singing the praises of Washington. I am glad you were able to find some in San Diego. I love your creative corn bread. It looks beautiful and must be so fragrant. I can adapt it and make it wheat free... I can't wait! Everything about this is lovely but I especially like your blueberry photo. This sounds like such a flavorful recipe. I am insanely jealous of you when you describe your markets there. Susan I made this bread, with just a few variations. It turned out GREAT! I just wanted to thank you for sharing! I posted it too, so you can take a look at my version. Ooh, yum! I love blueberries in baked goods, like little treasures. My grandmother lives in central WA and she always gets mountains of blueberries from the bushes lining her driveway. I wish I loved closer to her, she used to give us margarine tubs full of them every year. I just love cornbread, but have never made it like this. I will try this for sure! OK, it's official, I'm swooning!! Blueberries in cornbread are bad enough and then you go and add basil butter?? It's just delicious sensory overload!